Click the Network link under the Tools menu in the Dashboard. 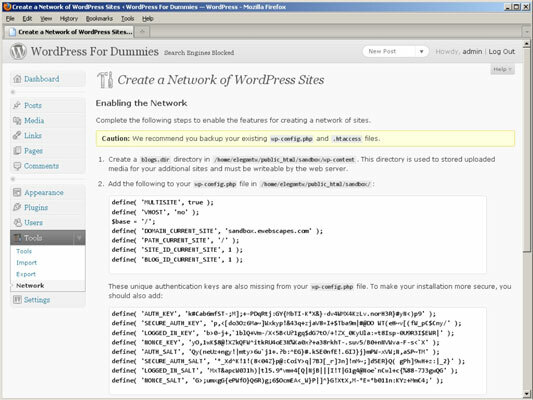 A page called Create a Network of WordPress Sites appears. Select subdomains or subdirectories as the addresses of the sites in your network. Make sure you’ve made your final decision on this issue, because you can’t change this selection later. Type the title of your network in the box labeled Network Title. Type the e-mail address of the site administrator in the Admin E-mail Address box. Typically, the site administrator is you. This is the e-mail address to which all site-related items will be sent. For example, all messages about new sign ups, newly created blogs, and other administrative communications will be sent to this address. The Enabling the Network page opens. Create a directory on your Web server called blogs.dir in the WordPress installation directory folder labeled /wpcontent/. The entire path should look something like this: /public_ html/wp-content/blogs.dir. This is the directory that stores all uploaded media (photos, videos, audio, and other media) within the network blogs on your domain. Add the Network related configuration lines to the wp-config.php. On the Enabling the Network page, in Step 2, WordPress gives you up to 15 lines of configuration rules that need to be added to the wp-config.php file. Copy the lines from the Enabling the Network page, and paste them into the wp-config.php file, then save and upload them to your Web server again. WordPress gives you up to 13 lines of code that you need to add to a file called .htaccess on your Web server. You will find that file in the WordPress installation directory. Copy the lines of code from the Enabling a Network page in Step 8. Then open the .htaccess file and paste the lines of code there. Save the .htaccess file and upload again it to your Web server. Return to the Dashboard. Click the Dashboard link at the top of the menu navigation in the WordPress Dashboard. You may be asked to log in to WordPress again, because by following these steps you have changed some of the browser cookie handling rules.